To those who question the black South African contribution to World War I, Mbulelo Vizikhungo Mzamane tells the story of the sinking of the SS Mendi. "What has World War I to do with us?" an incensed historian asked during a heated debate at the Freedom Park Trust. Freedom Park, opposite the Voortrekker Monument in Tshwane, commemorates eight epochs in the making of South Africa, among them World War I. In some African quarters, however, the two "world wars" are considered little more than European wars for world dominance - which, to some degree, they were. This must be measured, however, against the colonial tendency to excise the colonised from history. This plays down the contribution of previously colonised people to the making of the modernworld - including their contribution to rolling back the ugly spectres of Nazism, fascism and oppressive forces of every description. And so we come back to the question: "What has World War I to do with Africans?" 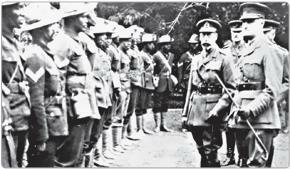 In 1916, Britain asked South Africa for troops to serve as labour battalions. According to the Military History Journal, 10 000 African volunteers from South Africa served in France between 1916 and 1918. They dug quarries, laid and repaired roads and railway lines, and cut tons of timber. Many were employed in the French harbours of Le Havre, Rouen and Dieppe, where they unloaded supply ships and loaded trains with supplies for the battlefront. They were placed under white officers and forbidden to carry arms; in all, 333 of these men perished in France. Most are buried at the military cemetery at Arques-la-Bataille. The story of the SS Mendi is a pertinent reminder of the sacrifices Africans made to "make the world safe for democracy". On January 16, 1917, members of the Fifth Battalion of the South African Native Labour Contingent set sail from Cape Town aboard the SS Mendi. They were the last of the African labour battalions to be shipped from South Africa. The ship was bound for Le Havre via Plymouth. Before dawn on February 21, five weeks after leaving Cape Town, it sailed into thick fog in the English Channel. Shortly before 5am, another ship, the SS Darro, appeared "like a monster from the deep" and rammed the SS Mendi. To quote from the Sunday Times Heritage Project archives: "Many of the men were crushed to death as they slept in their bunks, or were instantly drowned as water poured into the gaping hole in the ship's side." The SS Mendi sank in 20 minutes. An inquest established that the captain of the SS Darro, Henry Stamp, sailed away after about half an hour - leaving behind drowning men shrieking in the icy water. Survivors were later picked up by destroyers responding to distress calls from the Mendi. The inquest found Stamp responsible for the collision. He had been travelling at a dangerously high speed without his ship's warning fog signals. Stamp's only punishment, however, was suspension for one year. Of the 805 African servicemen on board, some 607 died, along with nine of the 21 white officers and 31 of the 69 crew members. The dead included the Pondoland chiefs Henry Bokleni, Dokoda Richard Ndamase and Mxonywa Bangani. There are many legends about the troops' bravery. Joseph Tshite, a teacher from the Tshwane area, encouraged the drowning men around him with hymns and prayers, until he drowned. There is also the story of the white sergeant who was helped by two black compatriots; they swam with him to safety. Survivor accounts attest to how the Rev. Isaac Wauchope (also known as Dyobha) exhorted the men: "Be quiet and calm, my countrymen, for what is taking place is exactly what you came to do. You are going to die, but that is what you came to do. Brothers, we are drilling the death drill. "Those left on board removed their boots and stamped the death dance on the slanting deck of the sinking ship, far from home but united, irrespective of their ethnic origins," according to research from the Sunday Times Heritage Research project. Wauchope told the men: "I, a Xhosa, say you are my brothers. Zulus, Swazis, Pondos, Basothos and all others, let us die like warriors. We are the sons of Africa." Wauchope was among the dead that morning. He was the quintessential missionary-educated African of the late 19th and early 20th century. He was born in 1852 in Doornhoek near Uitenhage into a family with strong connections to early Christian missionaries. After finishing school at Lovedale Institute, he worked as a teacher in Uitenhage. In September 1882 he played a key role in establishing Imbumba Yamanyama, one of the earliest political associations for Africans in South Africa. In literary history Wauchope is credited with launching protest literature in South Africa. In May 1882, writing as IW Citashe, he published his first poem. The poem exhorts Africans, after decades of resistance, to abandon their spears, which were no match for European weapons, and adopt other means, such as protest and persuasion. Your rights are taken away! Wauchope moved to Port Elizabeth, where he worked as a clerk and interpreter at the magistrate's court. In 1888 he responded to a call for "native" ministers and studied theology at Lovedale. On March 6, 1892 he was ordained and installed as pastor of the Congregational Native Church of Fort Beaufort and Blinkwater. In 1906 Wauchope joined the movement to create an institution of higher learning for Africans. Ten years later these efforts culminated in the foundation of the South African Native College, now the University of Fort Hare. In 1907, Wauchope fell foul of the law. After 18 months of administering the estate of a parishioner, he filed a will in his own handwriting and with the signatures of two witnesses. He was later charged with forgery. Despite the lack of evidence that Wauchope profited from the will, or had any intention to defraud anyone, an all-white jury found him guilty. He was sentenced to three years' hard labour at Tokai prison. He was released in 1912. Four years later he volunteered for the South African Native Labour Contingent and signed on as clerk/interpreter. In 1917 Imvo Zabantsundu, the first African-language newspaper in South Africa, founded by John Tengo Jabavu, described Wauchope as "a man of distinction - prominent in church, political, community and educational affairs". But few such eulogies were written about the rest of the men who went down with the SS Mendi. On receiving the news of the disaster, MPs in the South African House of Assembly rose to their feet as a gesture of respect. Despite this, however, African servicemen received none of the customary acknowledgements of service, such as ribbons or medals, routinely accorded to Europeans. Recognition for the men was long in coming. In 1986 the South African government gave formal recognition to the SA Native Labour Contingent, unveiling a bronze plaque at the museum at Delville Wood in France, showing the sinking of the Mendi. The Hollybrook Memorial in Southampton, England, a little-known memorial in Port Elizabeth, and the Mendi Memorial at Avalon Cemetery in Soweto - unveiled by Queen Elizabeth in 1995 - also commemorate the disaster. The SS Mendi is also honoured by the modern South African Navy, which has among its fleet the SAS Isaac Dyobha, a Warrior-class fast attack craft, and the SAS Mendi, a Valour-class frigate. Philani Nombembe reports that on the Mowbray campus of the University of Cape Town a bronze sculpture has been erected at the spot where troops of the South African Native Labour Contingent billeted before embarking on the SS Mendi for France. The sculpture, by Madi Phala, is one of the Sunday Times Heritage Project's memorials that honour remarkable people and events of the past century. The Mendi has also given its name to South Africa's highest award for courage, the Order of the Mendi Decoration for Bravery, bestowed by the President on South African citizens who have performed extraordinary acts of bravery. The commemoration of the sinking of SS Mendi, which lies on the ocean floor in the English Channel some 12 miles south of the Isle of Wight, is held on the third Sunday of February every year.